I’ve picked something a little different for J. Not a castle itself, but something associated with castles of the medieval period – Jousts. You might have seen the movie The Knight’s Tale, starring the late Heath Ledger, and the modern retelling of the chivalrous world of jousts and Chaucer. The backdrop of the tiltyard, the roar of the crowd and the chants are as entertaining as it was back in medieval times. Who knows, maybe they did sing along to rock music. The reality is always different. Jousts weren’t just about lances and horses charging at each other. They involved other kinds of combat and skills. Tournaments were big events and needed permits and knights to fight. Some of these jousters were available for hire and the highest bidder could lay claim to the best fighters. These jousters became known as freelancers, a term still used to day to refer to somebody employed for a temporary period. Starting out with rudimentary chainmail, over the centuries, the jousters progressed into increasingly more expensive armour, often only available to the nobility or royals. Winches were needed to lift the heavily armoured lord into his saddle. Suits weighed over 100 pounds.The agile movement of the knight was sacrificed with the protective layers of armour. The spectacle became more about show, less about combat. However, the chargers were still dangerous; jousts could kill or maim. Henry VIII fell from his horse in a joust and injured his leg. A wound that literally festered for the rest of his life. Henry II of France was killed by the splinter of a lance entering his eye. Eventually, the rise of muskets and guns brought jousting to an end. Swords and armour fell out of fashion by the 16th century. What was left was often choreographed for the benefit of the audience. Today, the notion of jousts is still largely entertainment and thrill, but Health and Safety laws probably curtail the performances. At Kenilworth Castles in Warwickshire, the tiltyard, which is the term used for the enclosed area where jousts took place, was on top of a dam. The dam was constructed to create artificial lakes around the castle: a defensive measure. The lakes have long gone and the dam is now used as a walkway to the castle. The width of the dam is a good indication of the size of the tiltyard. In one of my works in progress, there is a description of a joust as imagined by a young woman sat in the ruins of a castle. The wind picks up, scattering leaves in its path. The air fills with the smell of horse breath and churned grass. At last the crowd encircling the lists fall silent, waiting impatiently and wide-eyed for the spectacle to begin. Trotting forward, the horse is held in check. Snorting loudly, steamy breath blows out of his nostrils and colours the air a misty grey. The night air has lingered into the day, keeping the frost and cold ever present. The horse demands its release. His front hoof stamps on the ground. However, no signal has been given. The crowd grows restless, unsure why there is a delay and they begin to shout chants. The tension grates on the rider, who’s trying hard to keep his steed under control. Through the eye slits, he can barely make out the wooden fence. In the distance, he sees his foe, similarly struggling with his mount. Oblivious to the damp air, he sweats into his undergarments. The weight and oppressive nature of the garb provides no ventilation. Twisting his rigid form, he tries to see the scarf, still held up high and blowing in the breeze. Leather creaks, as his saddle strains with the extra movement. Discomfort for the rider is inevitable and serves only to make the seconds drag like hours. It has only been moments since their lances rose, pointing down the line. Merely ten or so breaths taken by both opponents. Then the red cloth falls. Floating, for a moment it catches an up current and drifts unsure of gravity. Then it slumps unable to resist the lure of the slippery grass. Briefly the horses rear before the command is given. They charge straight towards each other, unfettered by their scampering grooms. The tilt has begun. All your posts take me away, to a different time and place. Well done on this, and all the rest! Must have been a great sight! What an interesting subject. I go to an annual jousting re-enactment at one of my local castles. You know that nobody will get hurt too badly, but it’s still very thrilling to watch. Keith’s Ramblings: a story with 4 neglected J words! These days I imagine it’s very tame! Great description! I love ‘The Knight’s Tale’. Happy atozing! This is really good writing. Thanks for the explanation too. Thank you, I’m glad you found it informative. Glad you got a bit from it. Thanks for stopping by. It’s syill a popular form of entertainment, even if no real knights are involved. Great post and I really enjoyed your extract. 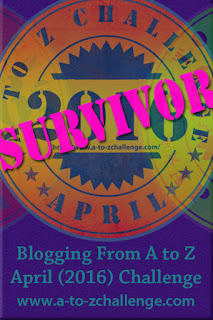 Glad to have found your blog so late in the a-z challenge. I will be checking on your other posts as soon as I have some free time. Thanks for picking one of my favourite topics for the challenge this year.